Causes warts and genital lesions; latter may be premalignant or malignant. Hyperplasia of prickle cells and excess keratin in skin biopsy, vacuolated squamous epithelial cells. Human papillomavirus (HPV) antigen detected in clinical samples by immunofluorescence assay (IFA), immunoperoxidase. HPV DNA detected in biopsies, cervical smears. Papillomaviruses (HPVs) cause skin warts, most commonly in children and young adults, which may reflect acquired immunity in older age groups (Box 1). Laryngeal papillomas are found most commonly in young children and middle-aged adults. Genital warts (condylomas) are most common among sexually active patients and are sexually transmitted. Recent studies suggest that genital HPV infections may occur in 20% of females and are associated with cervical dysplasia, neoplasia, or both. HPVs are nonenveloped, icosahedral virions measuring 50 nm in diameter. Their DNA is double-stranded and circular. The capsid consists of two structural proteins forming 72 capsomeres. Classification of HPV is based on DNA relatedness because these viruses cannot be grown in tissue culture. Based on DNA sequence homology, at least 77 HPV types have been identified. Viruses in similar groups frequently cause similar types of warts. Pathogenesis. HPVs infect and replicate in cutaneous and mucosal epithelium, inducing epithelial proliferations (warts). These growths remain local and generally regress spontaneously. However, the HPV genome can persist in transformed cells and may be involved in maintaining tumor growth by increasing cell proliferation or prolonging the life of epithelial cells. There are two main types of skin warts: flat, or superficial, and plantar, or deep growths. Most persons are infected with the common HPV types (1 through 4), which infect keratinized surfaces, usually on the hands and feet, and occur frequently in childhood or early adolescence. They regress spontaneously if given time. Single oral papillomas are benign epithelial tumors of the oral cavity. They are pedunculated with a stalk and usually have a rough papillary appearance to their surface. They can occur in humans of any age group, are usually solitary, and rarely recur after surgical excision. Laryngeal papillomas are most often caused by HPV-11 and are the most common benign epithelial tumors of the larynx; however, laryngeal papillomatosis is usually considered a life-threatening condition in children because of the danger of airway obstruction. Occasionally, papillomas may extend down the trachea and into the bronchi. Genital warts (condyloma acuminata) occur almost exclusively on the squamous epithelium of the external genitalia and perianal areas, and ~90% are caused by HPV-6 and -11. Anogenital lesions infected with these HPV types rarely progress from benign to malignant conditions in otherwise healthy individuals. Cytologic changes characteristic of infection (koilocytotic cells) in cervical smears that are Papanicolaou stained are detected in ~5% of women. Infection of the female genital tract by HPV-16 and -18 and, in 30% by other types is associated with intraepithelial cervical dysplasia, neoplasia, and cancer. The first neoplastic changes noted by light microscopy are termed dysplasia and ~40-70% of these lesions undergo spontaneous regression. The development of cervical cancer is thought to proceed through a continuum of progressive cellular changes from mild (cervical intraepithelial neoplasia I [CIN I]) to moderate (CIN II), to severe (CIN III) dysplasia, carcinoma in situ, or both. This sequence of events has been documented to progress over a period of 1-4 years. A wart can be confirmed microscopically by its characteristic histologic appearance, consisting of hyperplasia of prickle cells and the production of excess keratin (hyperkeratosis). HPV infection is suggested by the presence of koilocytotic (vacuolated) squamous epithelial cells that are rounded and occur in clumps. HPV virions can be seen by electron microscopy in lesions as can HPV antigens by immunofluorescent and immunoperoxidase techniques. Use of molecular probes to detect HPV DNA is the method of choice for establishing the presence of HPV genomes in cervical swabs and in tissue. HPVs do not grow in cell cultures, and tests for HPV antibodies are rarely used except in epidemiologic surveys. Spontaneous disappearance of warts is the rule, but because this may take many months to years, intervention is sometimes warranted, especially for painful or bulky lesions (Box 2). Removal by surgical cryotherapy, electrocautery, or chemical means can be effective, although recurrences are common. Application of podophylline or salicylic acid with formalin or glutaraldehyde is effective. Injection of interferon is also beneficial. Surgery may be necessary for laryngeal papillomas. Vaccination with formalin-inactivated HPV or autogenous preparations from the patient's own lesions has been at least partly effective, especially for anogenital warts (Box 3). Neither of these approaches is widely used, but vaccines may assume greater importance if an etiologic relationship between HPV and carcinoma is established. At present the best prevention is avoidance of direct contact with infected tissue. These viruses are latent in humans and reactivate to cause disease in immunocompromised patients. JC virus is the cause of progressive multifocal leukoencephalopathy; BK virus causes urinary tract disease. Papovavirus disease is diagnosed by urinary cytology or detection of viral antigens or DNA in clinical specimens. 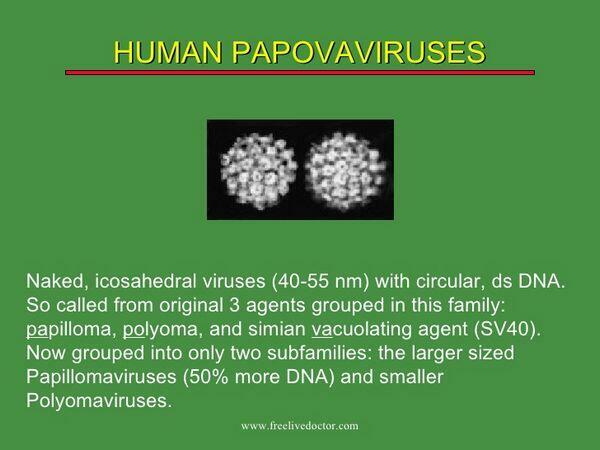 There are two important human papovaviruses: BK and JC viruses. SV40 is a simian polyomavirus that may be present in monkey kidney cultures and did contaminate certain lots of oral poliovirus vaccine (see below). 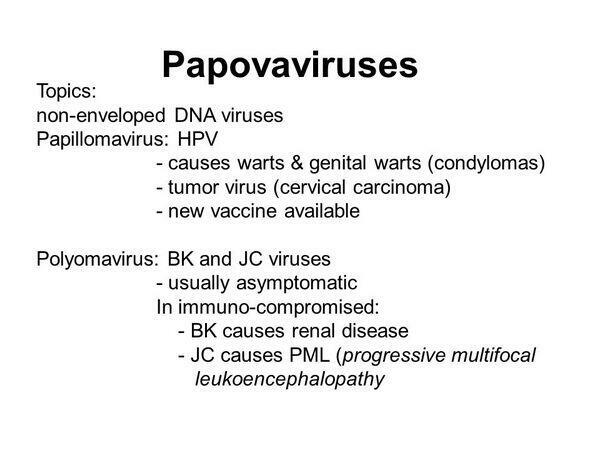 The most important disease caused by a papovavirus is progressive multifocal leukoencephalopathy (PML) (see site). Approximately 60-80% of adults have antibody to both BK and JC viruses (BKV and JCV, respectively). There is a major rise in antibody prevalence during childhood, with BKV infections occurring earlier than those caused by JCV. These viruses remain latent and are reactivated by immunosuppression. Polyoma virions are nonenveloped icosahedrons ~45 nm in diameter. The genomes of BKV, JCV, and SV40 are closely related and are divided into early, late, and noncoding regions. The early region codes for nonstructural T (transformation) proteins, and the late region codes for three viral capsid proteins (VP1, VP2, and VP3), which are receptor-binding sites. The noncoding region is the site of DNA replication and transcription control. The replicative cycle includes penetration by endocytosis, followed by uncoating and viral multiplication in the nucleus. Infection may result in cell lysis or nonproductive infection. The viral replication cycle takes 48-72 h.
Polyomaviruses have a high specificity for certain hosts and particular cells within that host. In humans both JCV and BKV probably infect via the respiratory tract, spread by viremia, and infect the kidney. In immunocompromised patients, reactivation of virus in the kidney leads to urinary tract infection (BKV) or viremia and central nervous system infection (JCV). Suppressed T cell function appears most responsible for reactivation. Histopathology results from the cytolytic effects of the virus rather than local immunologic factors. BKV and JCV cause tumors when injected into hamsters; however, they are not consistently associated with any human tumors. Early lots of poliomyelitis vaccine were contaminated with SV40, a simian polyomavirus, which was undetected in the cell cultures of monkey origin used to prepare the vaccine. Although many people were vaccinated with the contaminated lots, no SV40-related tumors have been reported during 25 years of follow-up. Primary infection is virtually always asymptomatic, although mild respiratory symptoms might occur, and cystitis has been reported (Box 4). In ~40% of immunocompromised patients, urinary excretion of BKV and JCV is commonly observed. Reactivation also occurs in pregnancy, but no effect on the fetus has been established. Cytologic examination of urine is the simplest method for documenting active polyomavirus infection. Virus may be demonstrated in tissue or cells by immunofluorescent, immunoperoxidase, or DNA hybridization techniques, and biopsy of brain has been the definitive method for diagnosing PML. Polymerase chain reaction analysis of cerebrospinal fluid is replacing biopsy as a noninvasive procedure for diagnosing JCV infection of the CNS. Culturing of polyomaviruses can be performed but requires specialized cells and may take weeks to months. Serology is not useful to diagnose PML because serum antibody is common in the general population. No treatment is established for BKV or JCV infection. PML has been treated with numerous different antiviral agents, and there have been conflicting results, especially with cytosine arabinoside. Spontaneous remission may occur, and diminishing immunosuppression may be beneficial. No preventive or control measures have been established for BKV or JCV infection.